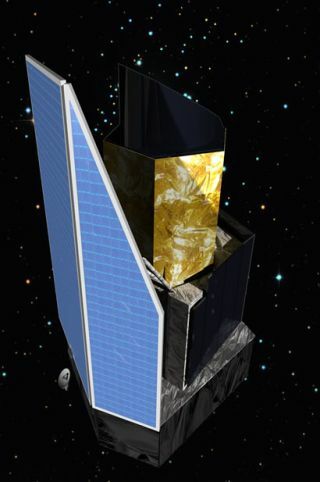 WASHINGTON — NASA should contribute $20 million worth of hardware to Europe’s planned Euclid dark-energy observatory, but only "in the context of a strong U.S. commitment" to the proposed Wide-field Infrared Survey Telescope (WFIRST), a panel of astrophysicists said. The National Research Council’s Committee on the Assessment of a Plan for U.S. Participation in Euclid was asked by NASA in November to determine whether that mission would help fulfill any of WFIRST’s science objectives. The European Space Agency (ESA) wants NASA to provide near-infrared detectors for Euclid in exchange for a spot on the 12-member Euclid science team and early access to the mission’s science data. ESA has said that if the United States wants to participate, a formal memorandum of understanding must be signed by mid-May. At a meeting in January, some panel members voiced concerns that contributing to Euclid might make WFIRST appear redundant at a time when U.S. government agencies are facing pressure to cut spending. Euclid, one of two ESA M-class science missions selected in October for development, is to launch in 2019 on a Europeanized version of Russia’s Soyuz rocket. ESA says it wants, but does not need, a U.S. contribution to proceed with the mission. WFIRST has not yet made it off the drawing board and is not likely to launch before 2025, acting NASA Astrophysics Director Paul Hertz said Jan. 18. Note: This story was corrected on Wednesday (Feb. 8) at 1:30 p.m. to reflect the fact that Euclid will study dark energy, not dark matter, as was originally stated.